Hello 221 collectors and friends! Sorry, Leo and I have been AWOL for a while. Leo got busy moving and updating his machines and I just got lazy. In the past Question Of The Week (QOW) we have been jumping from 1933 to 1957 and back. This week we are going to talk about my favorite 221’s, The AD SERIES or what I call the SPLIT BASE machines. IF this is your first time here, I suggest you go back to the November 2009 QOW and read all the earlier ones first? This way we won't leave you wondering what the heck I'm talking about. I guess we all know the AD SERIES were built from 1933 to 1935, and these were the first 221’s built by Singer and were introduced at the CHICAGO WORLDS FAIR? From Singers web site The First 10,000 were numbered from AD541546 to AD551545 Born OCTOBER-3-1933. I Know of FOUR with the CHICAGO WORLDS FAIR (CWF) badge that came from this First Production Run...They were AD544558, the 3,012th machine off the assembly line, AD544619, the 3,073th off the assembly line, AD547264, the 5,718th off the line, and AD549637, the 8,091th off the assembly line. SO! Original should mean original, just like the machine left the Singer Factory, right? Should you believe what others say is “original”? NOT! 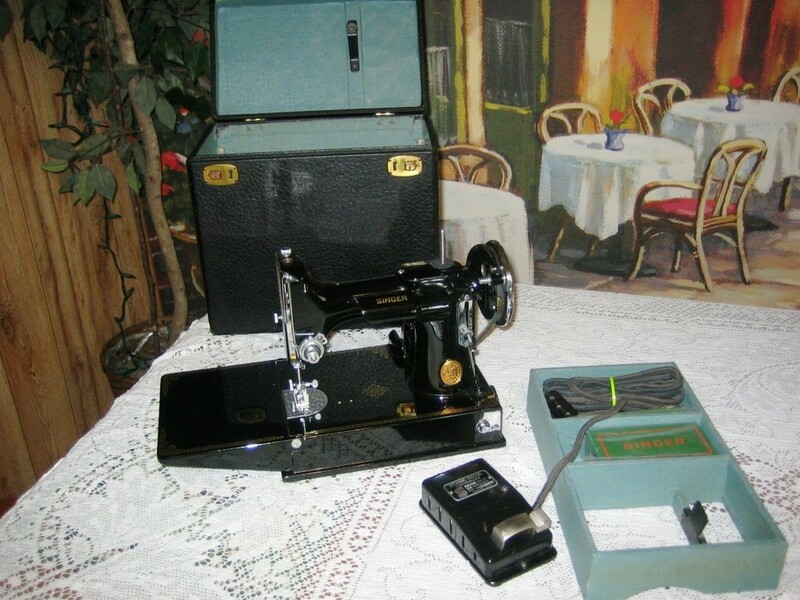 A recent eBay listing claiming an original 1933 that has a 1933 machine a 1947 Case a 1941 foot control and a 1950 (750) Manual. Hardly original. When your find or want to rebuild one of these beauties, you have to pay attention to what your looking at and for. Don't get all happy faced and let slick sellers get one over on you. 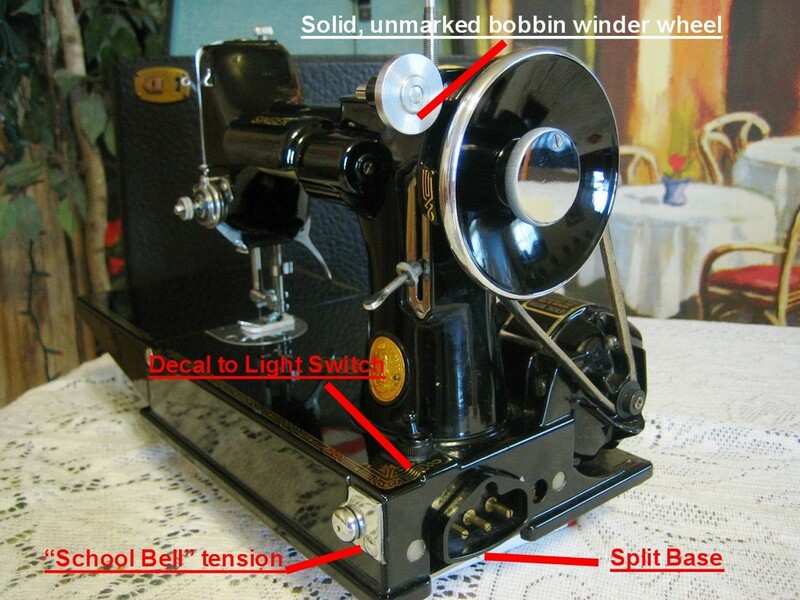 NOTE the SPLIT BASE, The DECAL to the LIGHT SWITCH, and the SMALL SOLID, Un-Marked Bobbin Winder Wheel. These were on ALL AD SERIES 221. 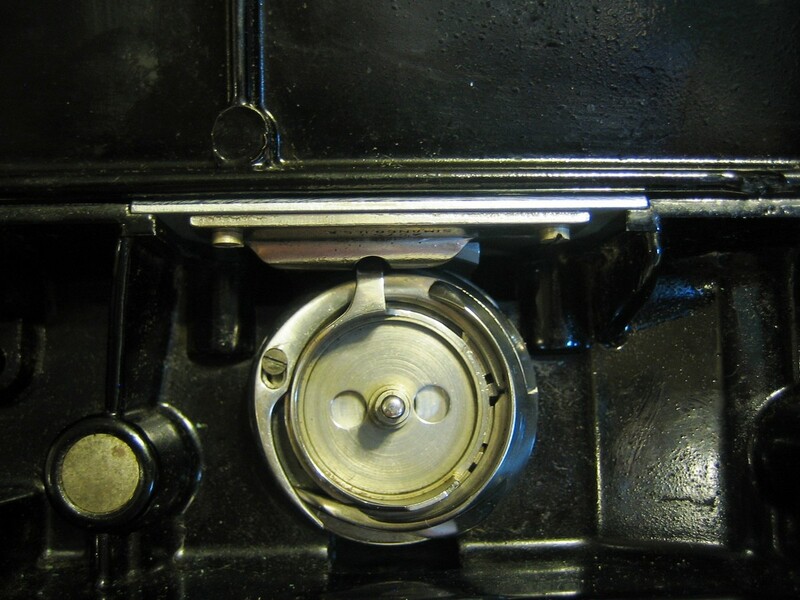 The CHROME Side Mounted Bobbin Winder Guide (School Bell) was on ALL 1933 and most 1934 and 1935 AD SERIES. 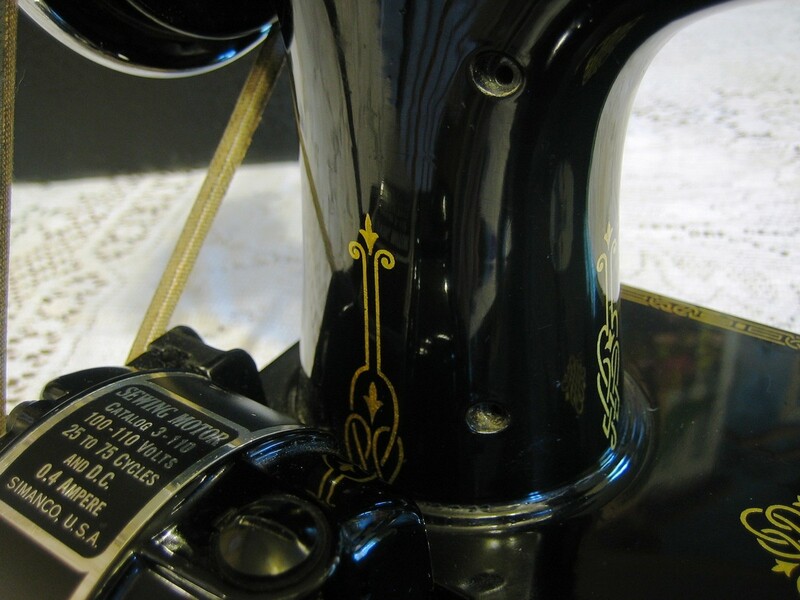 You can also find many AD SERIES with a Black Side Mounted Bobbin Winder Guide. DON'T know if these were Original at that era or where used to replace Broken Chrome tensions as the School Bell was pretty fragile. 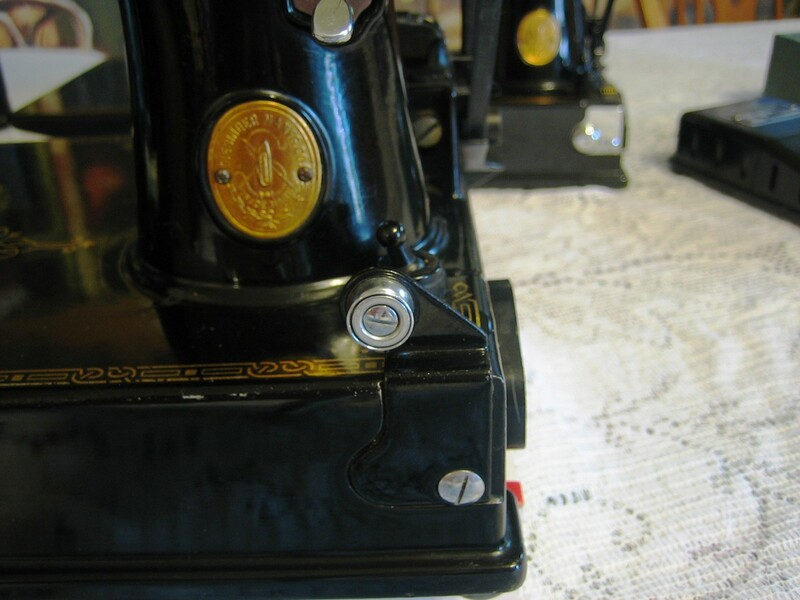 Another possibility is it was added as an aftermarket part to allow the machine to fit into the card table style sewing table introduced not too long after the 221 was produced. 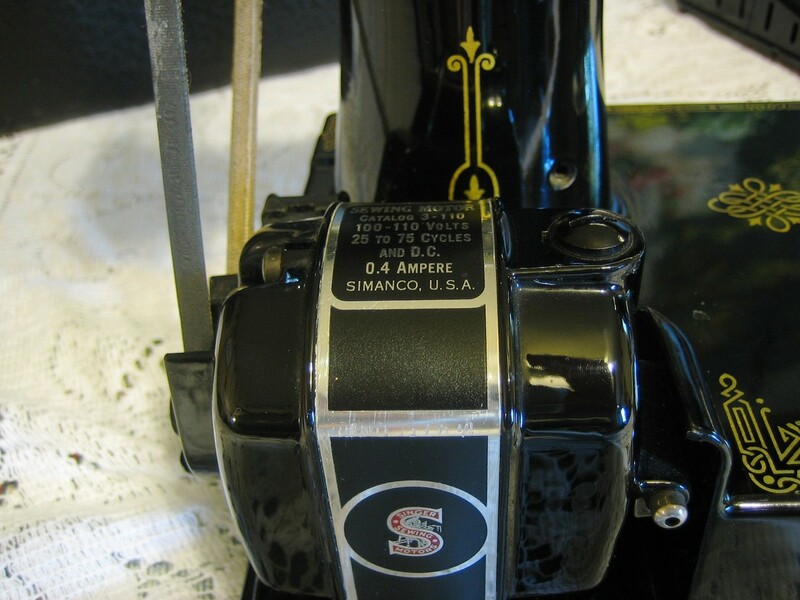 IN the picture below, note the “SINGER” Decal placed high on the light, and the Unnumbered Thread Tension. This again is Original on ALL AD SERIES. 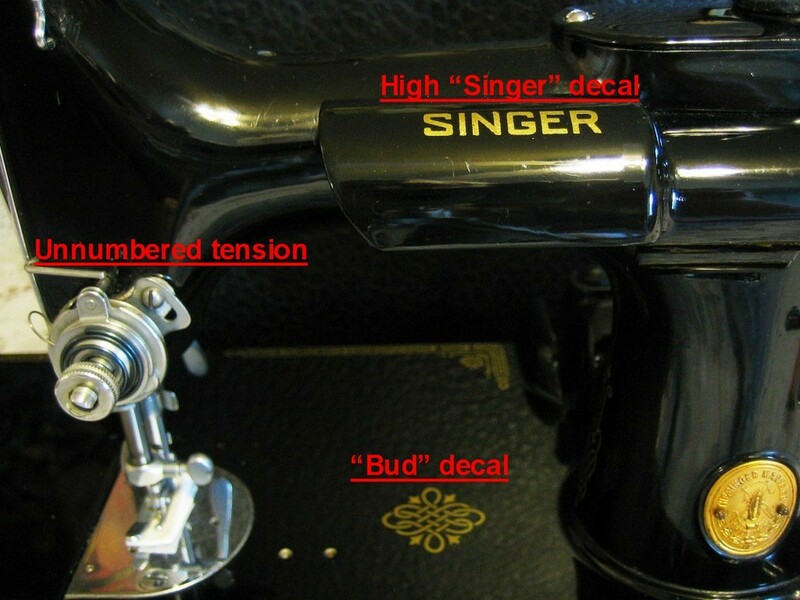 The BUD Decal on the machine bed was on, OUR GUESS, 200 or less of the first 221s. REMEMBER AD541705 or # 159 has the full up dated decal on its bed. At the back there was an ARM Decal in Front of the Motor. It was around till about AD546XXX and it was then removed, although it can be seen in just about every American 221 Owner’s Manual. Thank you to Arnold Ison for this photo. 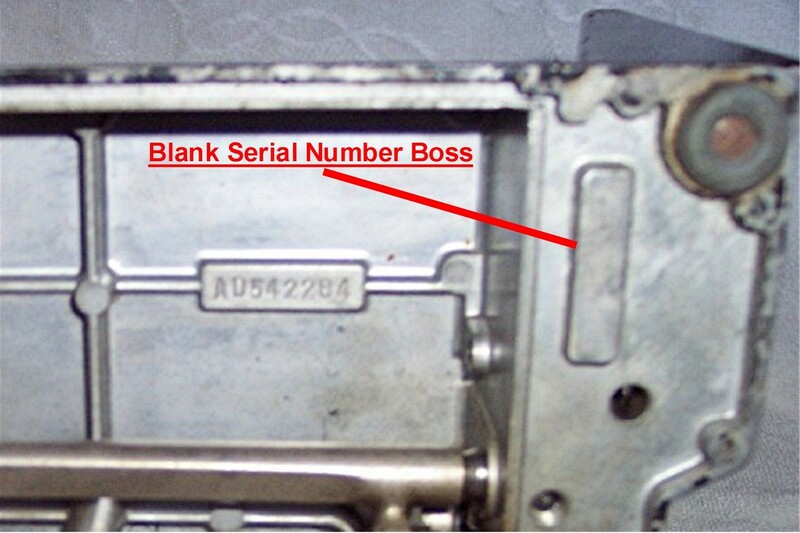 The SERIAL NUMBER and BASE that it is printed on were first Under the Oil Pan. We know that at AD542284 Singer ADDED a New BASE just to the RIGHT. 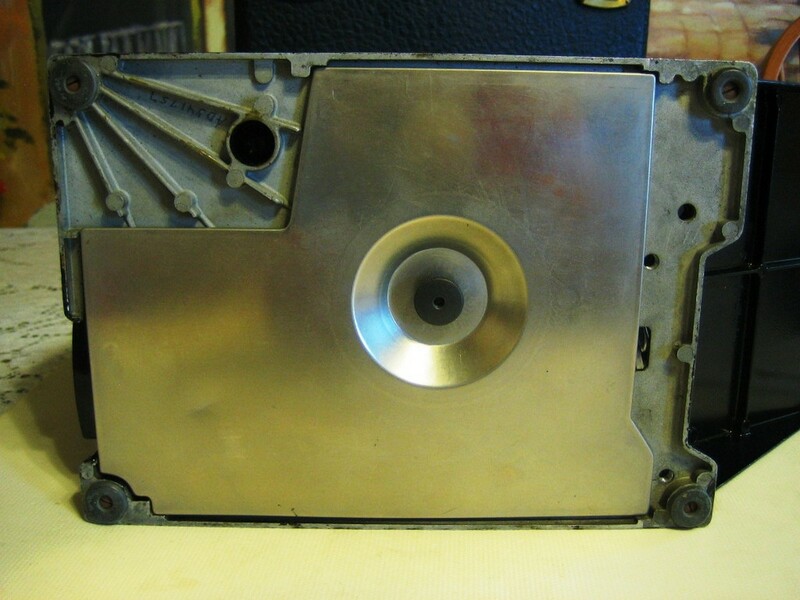 SINGER Kept Placing the Serial Number Under the Oil Pan AND! Left the NEW Serial Number BLANK. Till Around AD543XXX.SO! 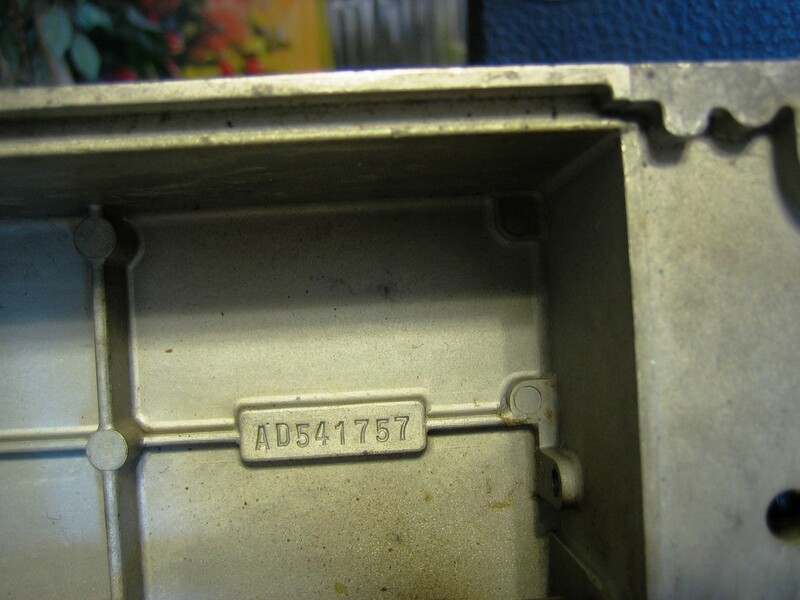 IF you have or Find an AD and the Serial Number BASE is BLANK, Look under the Oil Pan! ALSO! Note how clean and smooth the serial number is. IF you find a serial number with Sanding marks or looks very rough. SOMEONE has Tampered with it. 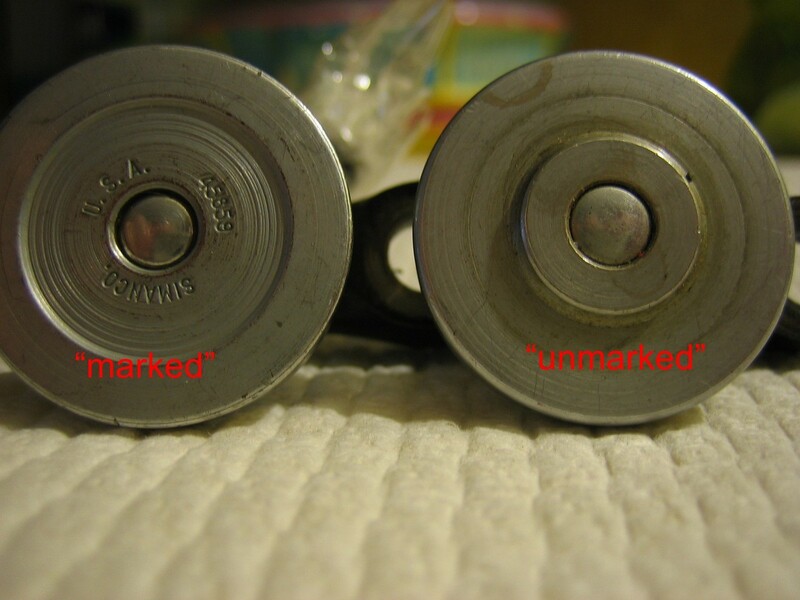 Leo did and article on Forged serial numbers in the November 2010 QOW. He found an AD722810 to be a forged AE 1937 era 221. So be careful there are thieves out among us. TYPE 1 CASE (below). Here is the machine with a TYPE 1 Case, NOTE the Hold Down Bracket on the Lid and the TRAY with the Large Hole in it. THIS is the ONLY thing the 221 has in common with the SEWHANDY. The TYPE 1 Case was around for most of the AD54XXXX Machines. By late AD54XXXX the TYPE 2 Case began in INTERMIX with TYPE 1 until they were all used up. 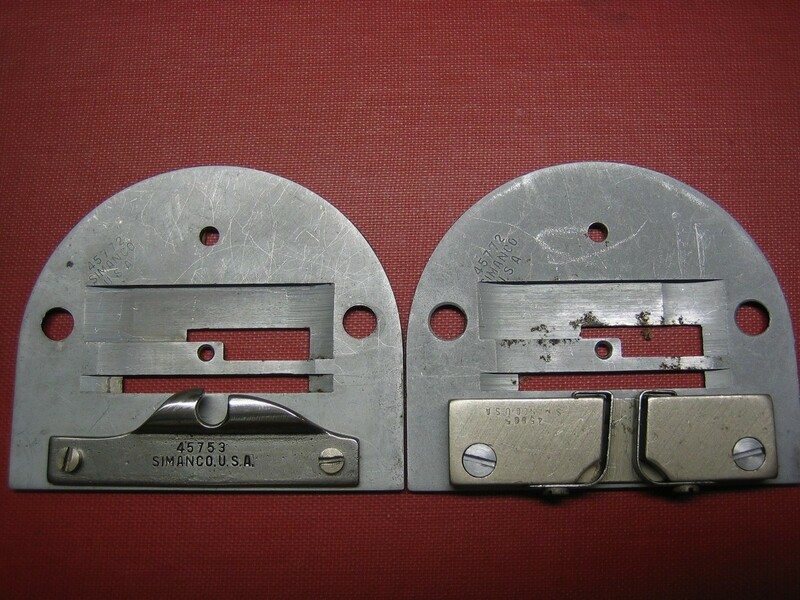 The TYPE 2 Case was Identical to the T 1 Except Singer Removed the Lid Bracket and Got rid of the Hole in the Tray. The TYPE 2 CASE was around till at least the AD88XXXX era in March 1935. 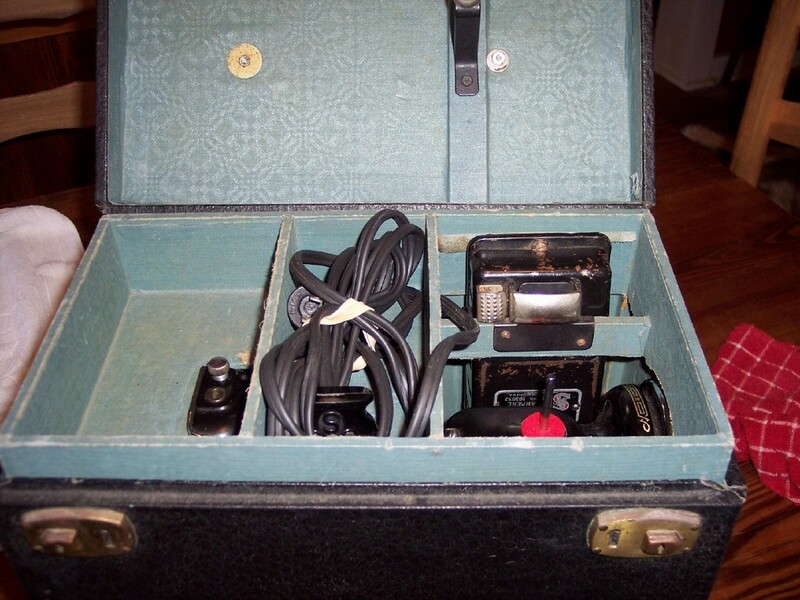 Type 2 case tray shown below. Leo has a very nice article on all the American 221 cases in the December 2009 QOW. 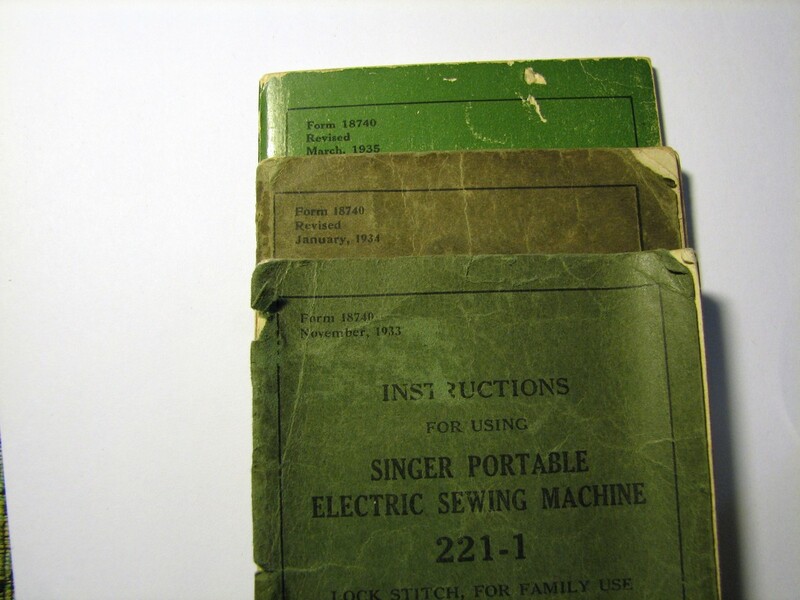 SINGER Made THREE 221 Manuals for the AD SERIES. The NOVEMBER 1933 is the rarest as there may have been 200 or so printed. KEYS: The TYPE 1 and TYPE 2 CASE had a very unusual set of Keys. Today these keys can run from $75 and UP. Four sellers that I have seen on eBay know this and have ripped off some 221 collectors. 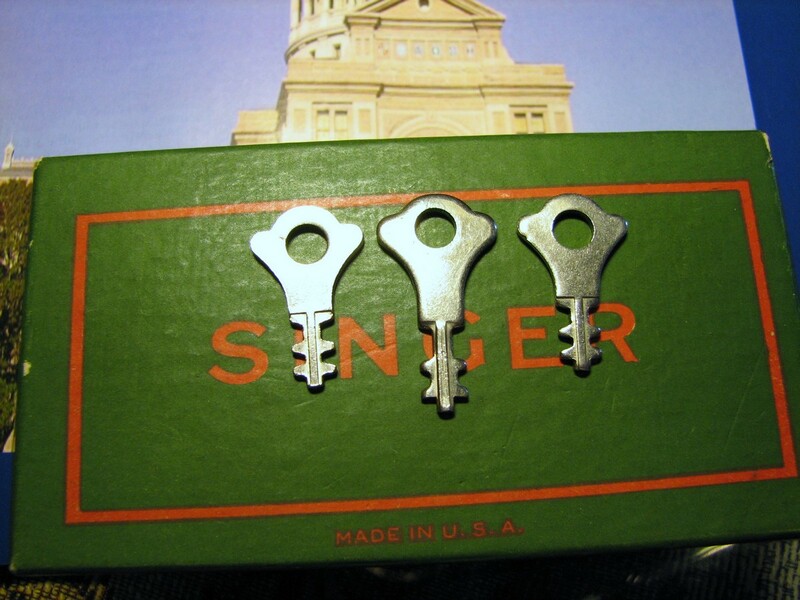 The ORIGINAL KEYS are 1 1/8" Long, Very Short. NOTE the MIDDLE KEY it is NOT a 221 Key. IT Will Not work!! ANY look-alike key with PRESTO is not a 221 key. The Real Key has no writing on it. BEWARE and ask for the measurement OR WILL IT WORK THE LOCKS?? 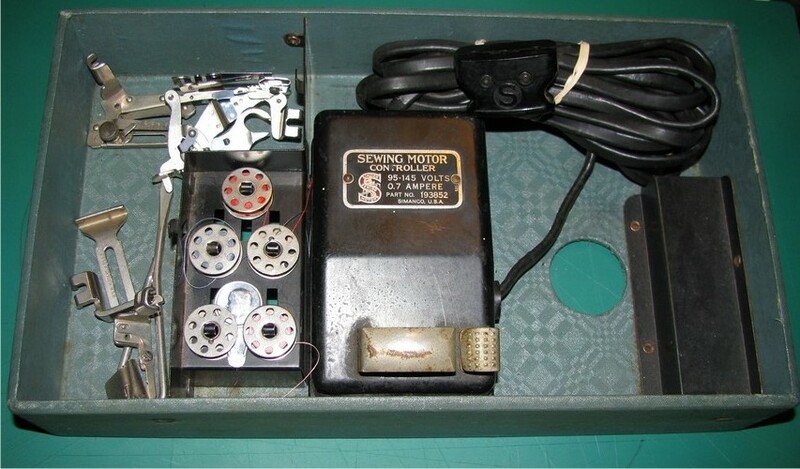 FOOT CONTROL: The EARLY First 200 or so Foot Control was # 193852 it was 0.6 AMP. 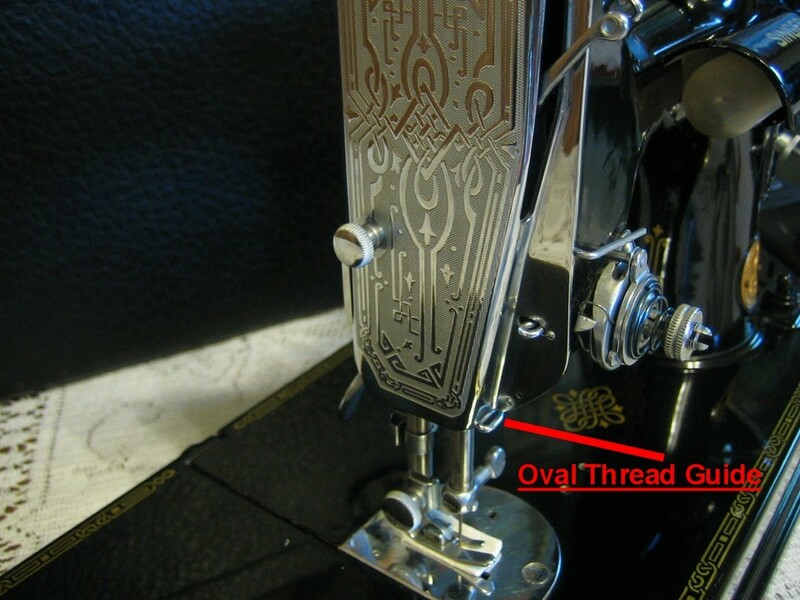 The Later Foot Control was # 193852, the SAME NUMBER But it was now 0.7 AMP. SO! The AD SERIES had TWO Foot Controls...Same Number Different AMPS. See the January 2010 QOW for more information on Foot Controls. 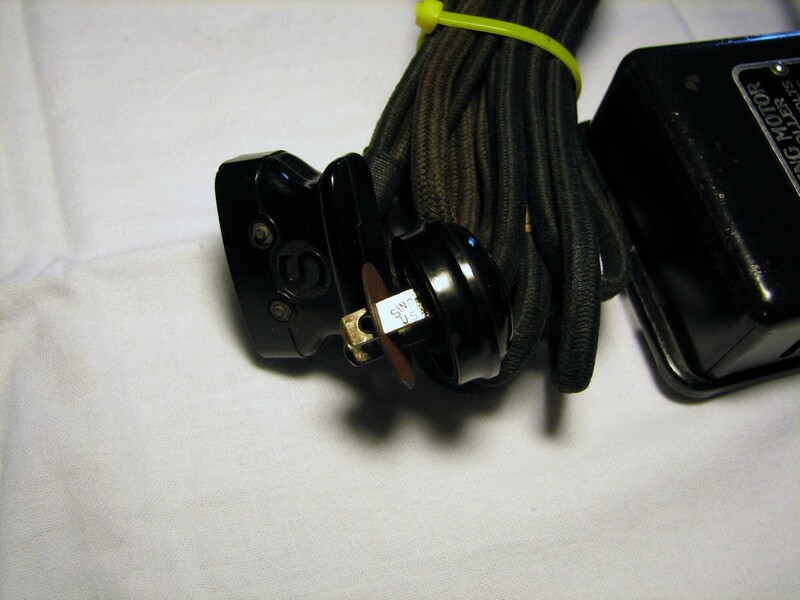 CORDS/PLUGS: ALL the AD SERIES had CLOTH Wiring. And Glass/ Bakelite Plugs. 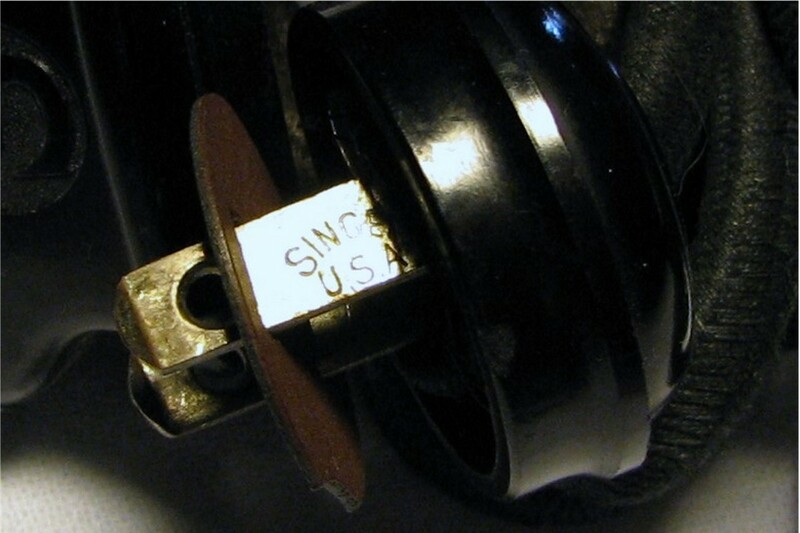 NOTE the WALL PLUG has "SINGER USA" on the Prongs. THERE you have it FRIENDS. Pretty much the History of the AD SERIES. LEO and I have spent many, many hours trying to trace down the History of these Beautiful Singer machines. When I first started collecting there was No eBay or other web sites. Back then when I bought a 221 it was pretty much original, with maybe an accessory part or two missing. NOT Today. Today if you’re out to find or build an all original 221, you have to know what your looking at and looking for. 99% of the sellers are good honest people and there is the 1% that is out to make a quick $. LEO and I truly hope your enjoying the site? Bring your friends and most of all do your Homework. DON'T FORGET to stop by and look at all the Beautiful 221, Leo has for sale. Leo is not just a painter he is an Artist and a True 221 collector and lover. I guarantee Leo will treat you more like Family than a Customer. THANKS for stopping by! The Next QOW we will show you the AE SERIES. Up Close and Personal.